Writers, how can we live without coffee and dessert to fuel our imaginations? Here at The Book-in-Hand Roadshow, we indulge often. What better reason for sweets than an anniversary party and you're invited. The Book-in-Hand Roadshow, we’re holding a light-hearted spring afternoon soiree. Please stop by Chateau LaMair on Sunday afternoon, April 7 between 2 – 5pm for this casual get-together celebrating the creative spirit and kicking off the third year of The Book-In-Hand Roadshow. ... Meet the guest speakers from previous roadshow events - local authors, editors, photographers, cover designers, proof readers, and publicists. ... Mix-n-mingle with BIH roadies and creative folks who have lived and worked at Chateau LaMair. ... Announcement of future dates/locations of The Book-in-Hand Roadshow. · Stair-stepping – unlike Tony Robbin’s fire walking – here’s your chance to test the new stairs to the Chateau’s Suite Retreat overlooking the vineyard (1,450 square feet of creative space in search of a tenant). Join us to enjoy a slice of pie in the spirit of creativity and sharing. "Start Organizing Your Book Today: How to move your book project forward when you don't feel like writing"
"TUNE-UP FOR CREATIVES - One-stop shop for your photos and resume"
Do you have what it takes to book a roadshow stop? or theater style seating; free parking. For details on how to bring the Book-In-Hand Roadshow™ to your town, contact Ingrid Lundquist at i.lundquist@events-TLC.com or call (916) 719-1776. A stop in your town will feature self-publishing experts in your region. "This was my first step in getting myself educated and networking with writers, and all that (goes with it) was fulfilled beyond my expectations." Ingrid E. Lundquist, CSEP is a Certified Special Event Professional, owner of The Lundquist Company and TLC Publishing. Her events have won international awards and earned her a reputation as a leader in creative solutions, innovative design and event management. Her projects range in size from an eight person team-building exercise to 35,000 attendees at a community festival. Ingrid is the author of the multi award-winning book Results-Driven Event Planning: Using Marketing Tools to Boost Your Bottom Line, and a contributing writer to event industry publications. 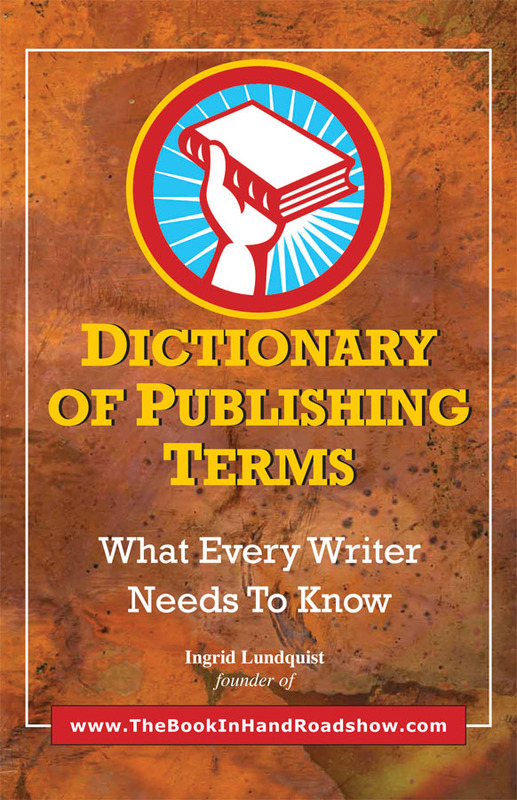 Her book, Dictionary of Publishing Terms: What Every Writer Needs to Know has won seven awards since being published in February of 2013. The Book-In-Hand Roadshow combines Ingrid’s expertise as an event planner with her experience and contacts in the book world. The BIH Roadshow sessions connect writers to experts in the field of editing, cover design, interior formatting, and photography who are local to the region where the roadshow is taking place. She enjoys entertaining, travel and photography. Ingrid lives in Granite Bay where she tends a small vineyard and dusts her Statue of Liberty collection. Logo design by Phillips Covers. TLC Publishing is an imprint of The Lundquist Company. Awesome Inc. theme. Theme images by billnoll. Powered by Blogger.